It’s hard to believe, but another year is almost completely behind us and the annual holiday travel season is nearly upon us. By this point, if you haven’t already booked your Thanksgiving flights you might be stuck in one of those horribly long airport lines that always make the evening news – but there might still be time to find Christmas travel deals if you don’t delay too much longer. Generally speaking, it’s best if you have even your Christmas flights booked by late October, but since we’re barely into November you might still find a few cheap air tickets available to the places you want to go. It’s likely you’ll have fewer options on flights and departures, however, so you’ll need to be even more flexible than normal when it comes to booking. Flying on Christmas Eve and Christmas Day tends to be an easy way to save money on holiday travel, so if you can manage to convince your family that you’ll get there in time for Christmas dinner then that’s definitely something to consider. If you’re fortunate enough to be traveling to a city that has more than one major airport within driving distance of where you need to be, it’s always a good idea to check flights into all area airports to see if one has better deals on flights. Sometimes the bigger airport will have the best deals because they have the most flights, and sometimes the smaller airport will win because they don’t charge as much to the airlines that fly there. And of course it can change – so look into all your options before booking. When it finally comes time to fly home for Christmas, even if you’re not someone who is typically – and obsessively – checking flight status up until the minute you leave the house, it’s a good time to get in the habit. 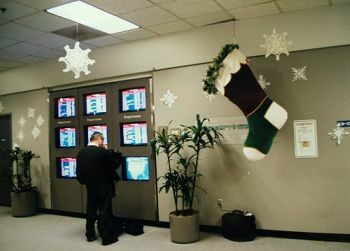 Flights at the holidays are often plagued by delays or even cancellations due to inclement weather, and if you happen to find out a flight has been delayed or cancelled before you leave home then you have more tools at your disposal (phone numbers and computer) to re-book if necessary.